OVER 1 BILLION DOLLARS IN REAL ESTATE SOLD! Today’s real estate market presents unexpected obstacles and opportunities. Firms that led in less challenging times, often find themselves at a loss when confronting present-day conditions. That’s because the business climate now requires seasoned trouble-shooting, performed with surgical precision. Something most firms just weren’t designed to do. Ken Marker and Corey Brown focus their expertise on each challenge. Professionals who are among the market’s most experienced and successful Brokers. Their work is backed by an aggressive team of knowledgeable professionals tapping unique resources. For the past two decades, they have been successful in closing hundreds of newly constructed homes and condos. Ken and Corey have been helping builders for a long time. Isn’t it your turn to have the BEST? KEN & COREY HAVE THE DESIRE TO SERVE, THE TOOLS TO PERFORM, AND THE ABILITY TO EXCEED YOUR EXPECTATIONS! With 53 combined years of Sales experience, we are always negotiating hard to get you the most for your property. Both of us are graduates in Business Administration from the University of Southern California where we majored in Real Estate Finance and Marketing. We know what owners go through – Owning, Managing and Building Hundreds of Units since 1988, we cover all of the bases, from purchase to sales, to ground up construction and new construction sales. The right networking plan helps hundreds of agent in and out of the area know about your property. The right marketing techniques can mean the difference in you selling your home for the most amount of money in the least amount of time. It is our goal to provide you with superior service at all times. 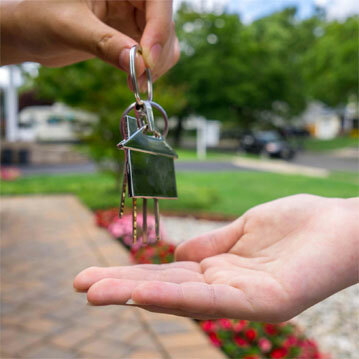 Our local expertise and extensive real estate experience will benefit you. 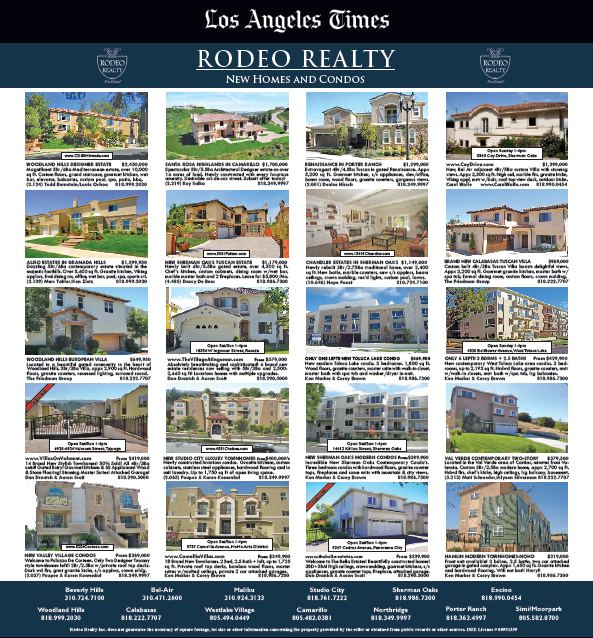 Multiple Listing Service: Project will be loaded into local MLS, Westside MLS including feed to Greater Los Angeles IDX MLS service to maximize exposure in all other multiple listing services. Internet Exposure: Rodeore.com / TheRealEstateGuys.com / Realtor.com Various international website listing advertisers including exclusive partnership with Realtor.com, Oodle, Trulia, and Propsnart with automatic feeds and updates enhancing listing exposure throughout the internet. Additional listing campaigning with e-mail blasts in the surrounding area for prospects and brokers. Specific www.projectname.com website also available, see examples. Brochures: Professional, custom-designed brochures, 2-sided color. Professional photography. Open houses: Varies by project. E Marketing: We have thousands of signature cards and Broker Emails for a massive email campaign. 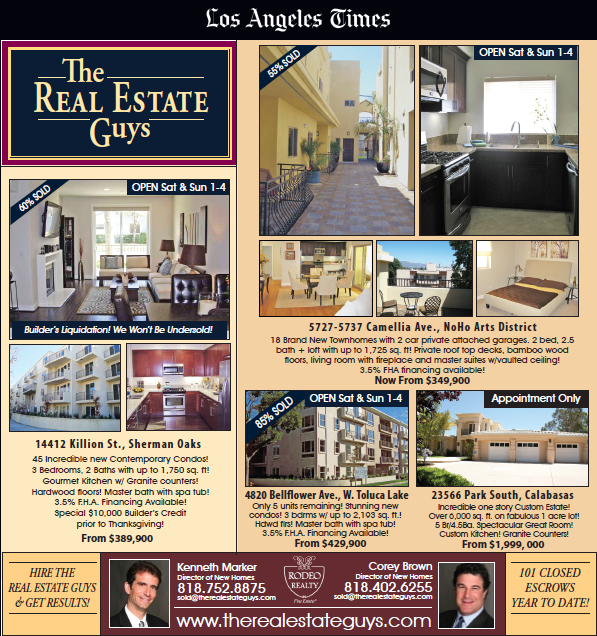 Advertising: Multiple Box ads will be run each weekend, including New Homes Section of LA Times. Full page ad for Opening also color ads, and Full page Color Caravan magazine. Staging: We will coordinate a Decorating/Staging company to furnish a model. Buyer Incentives: We have many creative Buyer Incentive Programs. Trailers & Human Signs: We design and pay for trailer sign(s). Sales Team: One full-time Agent with a second agent on weekends to assist if necessary. Sales Support: We have a full-time licensed assistant besides my sales force of 5 licensed agents, and a transaction coordinator who handles nothing but files and paperwork. We have an in-office Advertising supervisor to assist in ad placement. 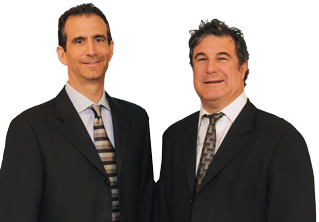 Ken has been licensed since 1988, and Corey since 1992. Education: All agents that will work at your project will have previously worked on other tracts for other builders and know New Housing. We will continue ongoing education on your contact and CCR’s, including writing practice contacts and Mock sales until we are perfect and 100% knowledgeable. Negotiations: We have many different strategies that are proven. Escrow: Ken and Corey, along with the transaction coordinator, are on top of all important dates and milestones for each sale, including contingency removals. Traffic Report: Weekly or bi-weekly reports, with sign-in cards. Sales Analysis: Weekly or Bi-weekly between you, me and the host agent, to evaluate our sales effort.